I just received an email from one of the Quilting Biz community readers. She is seriously considering purchasing an existing quit shop in her area, and she had some questions about the process and what she can ask for during the negotiations and in the purchase of the business. She also wanted to know when to get the lawyers involved (always a scary issue!). Do you have any recommendations for someone investigating buying an existing quilt store business? Some basics on inventory, purchase of office equipment and POS systems but not the building. Is it feasible to write in the contract for the new owner to work in the existing store to get to know the systems, vendors and customers? When should I get a lawyer and/or accountant involved? Please do not use my real name in any publication. First off, everything is negotiable in a business transaction of this type. This means that the value of the business – the goodwill and branding, and even the inventory – as well as what kind of training you want from the existing owner. You can absolutely negotiate that the existing owner will stay on for 2 or 4 weeks to train you on the systems and suppliers. As far as when you should get a lawyer involved, I would suggest that you get a lawyer involved as soon as the discussions you are having with the existing owner turn serious. Once you get to the point where you want to do your due diligence on the store – i.e. get the books to see about sales and profitability – then you're going to want to have a lawyer involved to work out some of the legal details and to make sure you are getting all of the information you need. I would suggest that you find a lawyer who has done business transactions of this type (buying and selling of an existing business) so they know what to expect and where the skeletons are in the closet. For your building, I'm assuming that the existing owner is renting or leasing the space. Again, even the existing rent or lease agreement is negotiable. It may be that the landlord will be willing to renegotiate the lease for less if you sign for 2 or 3 years. Again, talk to a lawyer about this type of agreement so you know you're covered. I hate the fine print and legalese and a good lawyer can watch your back). And remember, when you do your due diligence, really take a look at what is going on now – the sales and profits, as well as the inventory turns – and what it is that the current owner is doing right AND wrong. If you can identify potential new profit centers (i.e. classes or adding a longarm quilting machine that quilters can “rent”), or ways that you can improve existing good programs (i.e. more classes, better communication with customers), you can increase the value of the business from day one. I really appreciate the interaction, and I wish you the very best of luck in your investigation. I hope it goes very well for you. Of course, I'm not an attorney, and don't claim to have any legal expertise. You should always consult a certified attorney for any legal advice, and use any other advice at your own caution (this is just to make sure everyone knows I'm not a lawyer, nor have I ever claimed to be one – or played one on TV!). 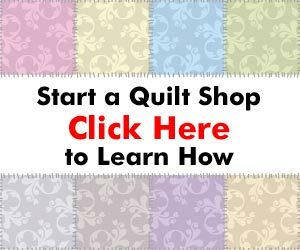 If you have any questions about starting, running, or marketing your own quilt business, please use the Contact form and I'll try to get back to you as soon as possible.